One common risk factor for falls among seniors is poor lighting. It’s inevitable that as we get older our eyesight diminishes. Be it near-sighted or far-sighted -ness, we just don’t see things as clearly as we used to and shadows give way to increased tripping hazards. Floor lamps are an easy and simple way to increase the style and illumination in any room, which, for seniors, creates a safer space. With so many lamps available, it can be a bit daunting to determine which best meets your needs. We’ve worked to make this convenient for you. Here are nine of the best floor lamps for aging in place. This lamp has a classic design, it is Alexa compatible, it is versatile, and the LED bulb lasts for 20 years. The LED bulbs limit heat production and are eco-friendly. The beauty of the Brightech Montage – Bedroom and Living Room LED Floor Lamp is the on/off foot pedal operation. This pedal is part of the cord so the lamp avoids buttons and switches at the top of the unit which can easily break. This lamp is lightweight and relatively easy to assemble, although some people have had problems with the threads not lining up when screwing the poles together. At just over five feet tall, you can place it behind or next to any bed or chair, just remember that the on/off switch is on the floor, so you don’t want to place it too far behind something. The weighted base ensures that it remains stable. The LED bulb is long-lasting and saves on energy, and shines downward more than up, perfect for lighting up those pesky shadowed areas and ideal for reading. An added feature is that the Brightech Montage is compatible with Alexa and other smart outlets, increasing the ease of use. To use this feature, you will need a smart outlet. This lamp is multipurpose, practical, and offers shelving for storage. The Adesso Middleton Floor Lamp is a functional option to add both extra storage and illumination to any room. This multipurpose lamp is compatible with multiple bulb types, including a CFL, incandescent, or an LED. Only one bulb is necessary. There are two shelves, but since the bottom has a base, this can serve as a third shelf. Because of its lightweight design, we recommend placing something heavy on the bottom shelf to help keep it stable. Each shelf is wide enough to hold a beverage, remote control, phone and/or book. Turn the lamp on or off using the pull chain and black cord. The narrow size allows you to place it just about anywhere. Keep it clean with a soft and damp cloth. We recommend the Adesso Middleton Floor Lamp for seniors who need a little extra illumination, but not necessarily for reading. It will lighten up hallways and the corners of rooms, but not be too overpowering. This lamp is dimmable, color changing, adjustable, and features a remote. 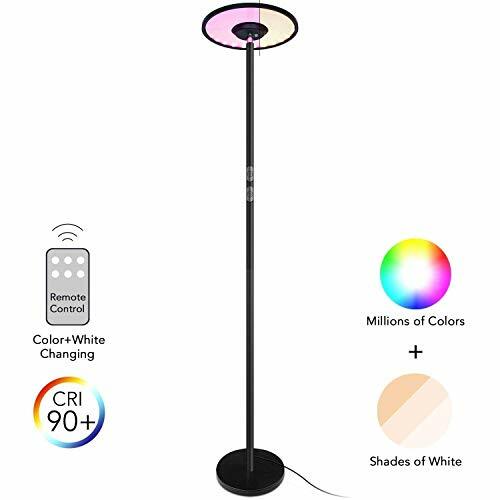 While the AntLux Dimmable LED Torchiere Floor Lamp is a fun and functional lamp, the thing we like best about it for seniors is its remote control, meaning you can adjust the brightness and the angle without having to get up. The illumination is very bright—ideal for lighting up a whole room and perfect for reading—but the dimming option allows you to fully choose your level of brightness. A unique feature is the actual head of the lamp, which is tiltable to a 90°degree angle, allowing you to light up any corner of the room. The fun factor is you can choose from various shades of white to a variety of colors, depending on the atmosphere you wish to set. All of the colors are dimmable as well. This energy-saving lamp uses LED bulbs, offering up to 30,000 hours of life. But as mentioned, it lands on our list for seniors because of the remote control, which is 360° degrees operational and omnidirectional. It has two touch-control buttons for convenience and you can use it from up to 25 feet away. This lamp has adjustable shades so that you can change the direction of the light. METAL FLOOR LAMP WITH PLASTIC SHADES: this 3-light design features a sleek and stylish black finish. 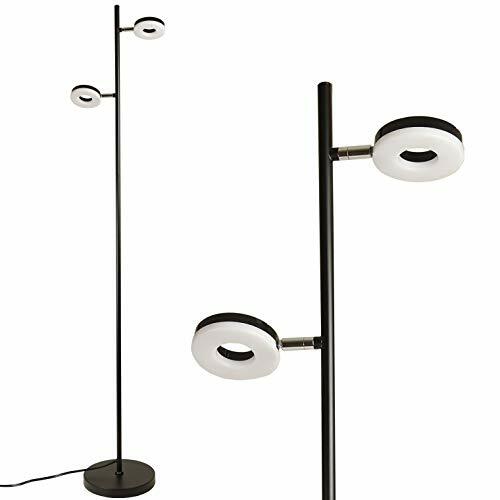 ADJUSTABLE SHADES: This floor lamp features adjustable shades that allow you to point the shades in different directions. ON-OFF ROTARY SWITCH ON EACH SOCKET: allowing you to illuminate your space fully, or focused on the area of your choice. The Light Accents Floor Lamp 3-Light Tree Style Standing Lamp is ideal for seniors to chase away the shadows, light up the corners of a room, and offers the perfect amount of light for reading. The lamp has three individual lights and are easy to adjust; the lights tilt at 90 degrees and rotate 360 degrees. Face all the lights on one thing or spread them out for significant lighting flexibility. Its small base and narrow body make it easy to place this lamp anywhere in your home. The plastic shades do not get overly hot, ensuring safety. This lamp is also lightweight, so it’s not difficult for seniors to move around and adjust its placement as they need to. The three light options allows for one, two, or all three lights on at any given time, which you can vary depending on if you’re just sitting reading versus having family and friends over. Having these options just add to the sense of independence while aging in place. As always, you can use either incandescent or LED bulbs, giving you a choice, but of course, when using the LED bulbs, the lamp provides greater energy efficiency. This lamp is adjustable and operates via a remote, making it ideal for numerous tasks. 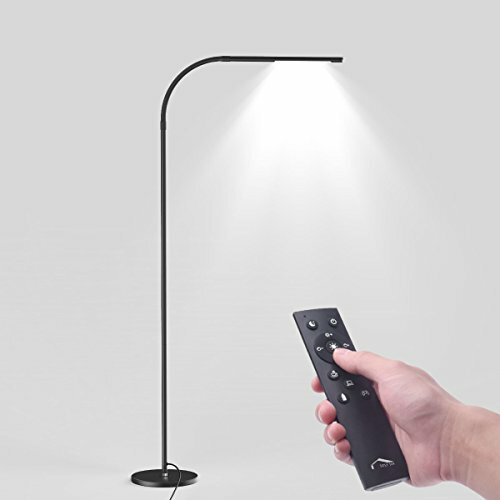 Another lamp with a remote control—that also works by touch—the Joly Joy LED Modern Floor Lamp provides sufficient ambient and task light for any room. What we like most about this lamp is its flexible gooseneck which allows you to aim the light in any direction. In addition there are five brightness settings and four varying shades of white light. These options allow you to adapt your light depending on if you’re on the computer, having a cup of tea, reading, or watching TV. It features dual operation modes, allowing you to operate it with a remote control or touch. The gooseneck offers a full 360 degree illumination and the range is quoted as up to 33 feet, so you should be able to use the Joly Joy Modern Floor Lamp in rooms of all sizes and still fit proper illumination for any task. The base has adequate weight, making sure that the lamp is stable on any floor surface, including carpeting. The thin base makes it simple to place this lamp even in small spaces and ensures greater safety in your space. This lamp is adjustable, bright, and quickly turns on and off. We recommend the Cal Lighting Adjustable Height Pharmacy Floor Lamp for seniors looking for a lamp that can be both short, to sit beside an easy chair or couch, and tall, to illuminate an area of the room. A versatile and stylish lamp, it features a two-piece pole which you can adjust the height of to best suit your needs. The height is adjusted with the turn of a knob; once you achieve the desired height, tighten the knob to lock it into place. The lamp head provides ideal task lighting and can move from side to side. The light turns on with a simple chain that you pull and the base is heavy enough that the lamp remains stable when you pull the chain. Inside the lamp, there is a heat shield to prevent bulb burns. This feature also prevents the light from putting off too much heat when it is in use. The CFL bulbs this lamp uses are energy-efficient. Whether you want this lamp to remain in one place and utilize its adjustable height, or move it around from room to room depending on your needs, the Cal Lighting Adjustable Height Pharmacy Floor Lamp is a solid, safe choice for seniors who need better illumination. Kenroy’s Modern floor lamp maintains a familiar design but with the ability to choose your desire light level. The Kenroy Modern Brushed Steel Floor Lamp offers a traditional, or ‘retro’, feel and features a clean white linen shade and dual pull chains for customizable light levels, allowing for two levels of brightness. This characteristic makes it possible to see faster, providing a safer and more efficient space. The chains hang below the shade, making them easy to reach and operate. There is double the light output since the lamp uses two bulbs. These function independently, so you can just turn on one bulb if basic light is needed, both bulbs if extra illumination is required. You can use LED bulbs for greater energy efficiency. The base is small, but sturdy, making it easy to place anywhere in the room. The lamp itself is five feet tall, allowing for both task and ambient lighting capabilities. The shade is a clean white color, so it does not obstruct the light the lamp emits, and it does not darken it. This design improves on the traditional lamp design with a swiveling arm for even more customization. 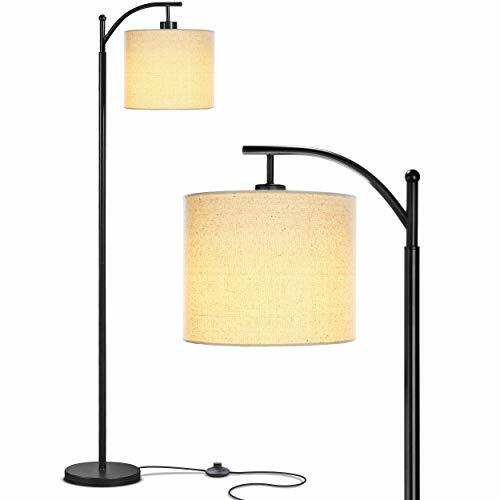 Ideal as a bedside, couch, or recliner lamp, the Kenroy Home Riverside Swing Arm Floor Lamp features a swing arm design allowing you to extend the light closer when needed. It is easy to direct the light to where you need it by adjusting the arm. You can pull the arm in to conserve space or push it out to allow for proper task lighting. The thinness of the base makes it easy to place this lamp in small rooms and the round base provides the stability it needs. You can tuck it behind furniture and just swing the light over when you need it. There are several bulb options that you can choose from, making it possible to use the type you prefer most. The socket switch is a three-way style—giving you options of brightness—but it still turns off and on quickly. We added the Kenroy Home Riverside Swing Arm Floor Lamp to our lamp picks for seniors because of its slim, classic design—thus its versatility—and the handiness of the swinging arm. This lamp has great utility besides just lighting with its magnification shade. 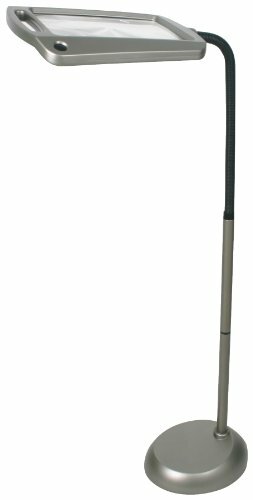 We recommend the Daylight24 Full Page Magnifier LED Illuminated Floor Lamp for seniors who enjoy doing crafts, table puzzles, need a little extra help when reading, and other similar activities. The magnification shade is ample, allowing you to read full pages and significant newspaper sections without constantly having to adjust. It’s ideal for attention-to-detail crafts like knitting, cross-stitch, or simple sewing projects, as well as determining the right puzzle pieces where needed. And because the head has an adjustable gooseneck, you can readjust the lamp to where you need to see something, rather than trying to contort yourself closer to your project. The LED bulbs ensure optimal energy efficiency and the bulbs last, so there is no need for frequent bulb changes to keep using the lamp. The light easily switches off and on with one finger. The adapter makes it easy to get power to the lamp anywhere for convenience. The shade has a handle, so you can conveniently and quickly move the light to where you need it. This lamp is safe since there is limited heat output. This feature is important because it means the likelihood of a bulb burn is very low. Choosing the right foldable cane seat is an important decision because it is something that you should be able to use for a while. After learning about a variety of floor lamps, it is time to explore the different features and characteristics. Knowing more about what these lamps can offer makes it easier for you to make the right decision. It is vital that your lamp provides sufficient illumination, so knowing some facts about this is beneficial. Lumens determine overall brightness. For brighter lights, you want higher lumens. Kelvin, or color temperature, tells you how cool the light will be, and the cooler it is, the bluer it appears. Lights are cooler as the Kelvins increase. CFL: This type of bulb uses energy with moderate efficiency, and it tends to last longer compared to incandescent bulbs. They quickly achieve full brightness since it only takes seconds for them to warm up. Fluorescent: This type of bulb is relatively common because it does not give off heat and it can be very bright. However, these bulbs are prone to flickering at times. Incandescent: This bulb type is ideal for DC or AC. While versatile, their overall energy efficiency is low. Halogen: These bulbs are not common in lamps and tend to get hot quickly. LED: This type disperses light efficiently and offers a warmer and softer glow. However, it is not a good choice for ambient lighting since it tends to be mostly directional in how it throws off light. This extensive information regarding floor lamps allows you to make the best choice. Consider this information and the lamp options to find the one that best complements your needs and decorative style. When it comes to selecting a floor lamp, take into consideration the area you wish to place it, as well as your needs and lighting expectations. Depending on the weight of the lamp head, whether you’ll be placing it on carpeting versus hardwood is also a factor to keep in mind. The main function of a floor lamp is illumination; sometimes you’ll want full brightness and other times you’ll want the light dimmed or on a lower level. For seniors who have trouble getting up and moving around, a remote control may be a necessity and will be worth the investment. Feeling safe and secure with the lighting in your home adds to your sense of independence and adds to the success of aging in place for you.